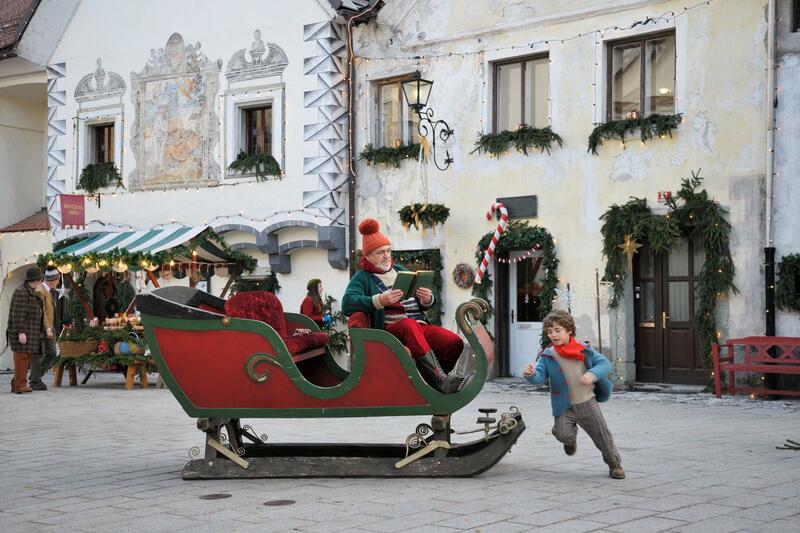 Eat, Drink and Be Merry in Festive Radovljica! 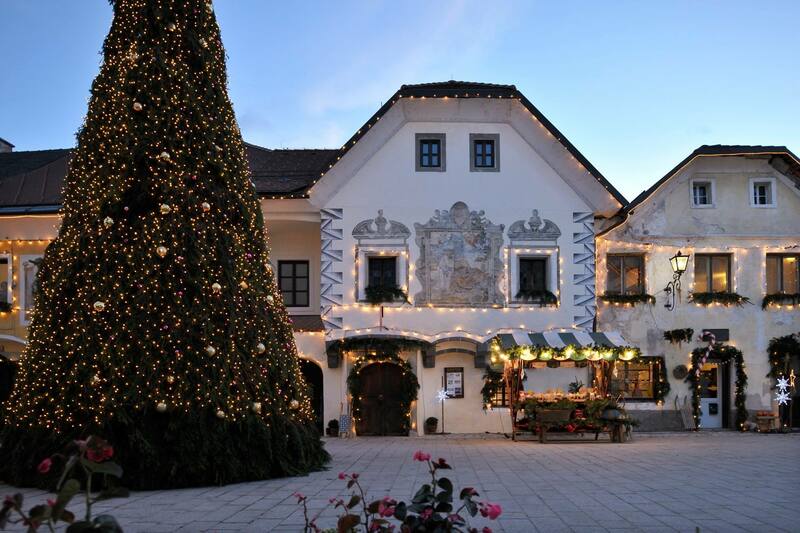 Word is rapidly spreading about how beautiful the Christmas decorations are this year in Linhart Square – the heart of the old town of Radovljica. If you haven’t visited yet, be sure to do so and find out why it’s the talk of the town, and further afield too! And while you are here, why not take some time to Taste Radol’ca too! 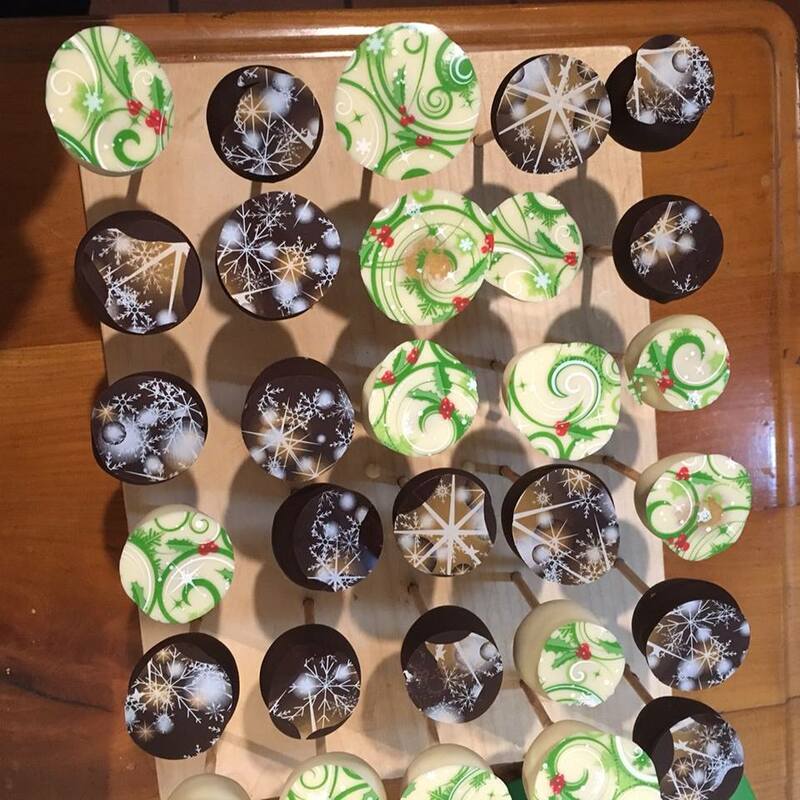 Kunstelj Inn’s famous cake pops with a Christmas twist! Since it can be a little bit of a faff, or at least I think so, trying to find out which restaurants are/aren’t open and when during the festive season, I decided to take it upon myself to do the hard work and compile all the information in one place i.e. here! So below is a full list – or rather of those that responded to my request for information. Note: restaurants are open as usual in the period between Christmas and New Year, unless otherwise stated below. * If you haven’t the time, or the will, to rustle up a gourmet home-cooked Christmas lunch, this year Vila Podvin is offering a fully-prepared takeaway version of their Christmas lunch. You could even pretend you made it yourself! More information and the full menu can be found on the Vila Podvin Facebook page (see the post, in both Slovene and English, dated 6th December). 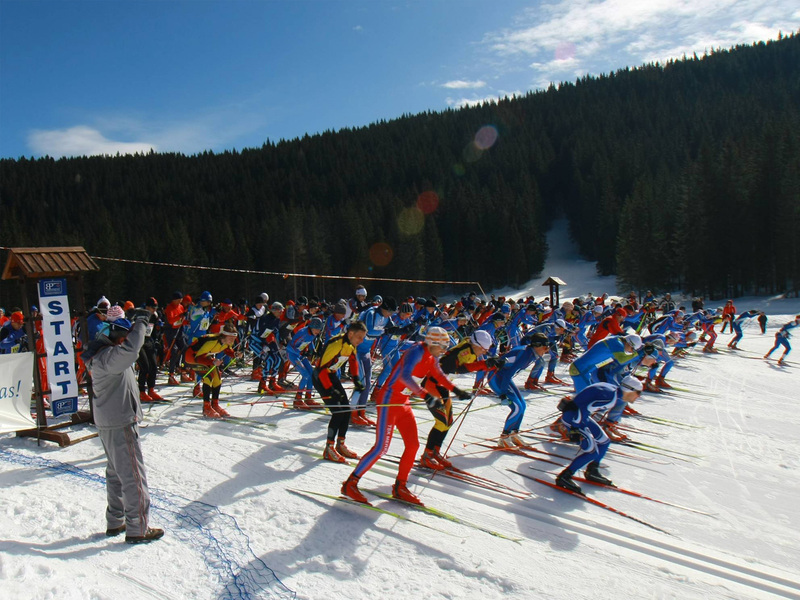 So, armed with information about what events are taking place, as well as information about restaurant opening times, there are now no excuses not to visit Radovljica this festive season! What are you waiting for?! 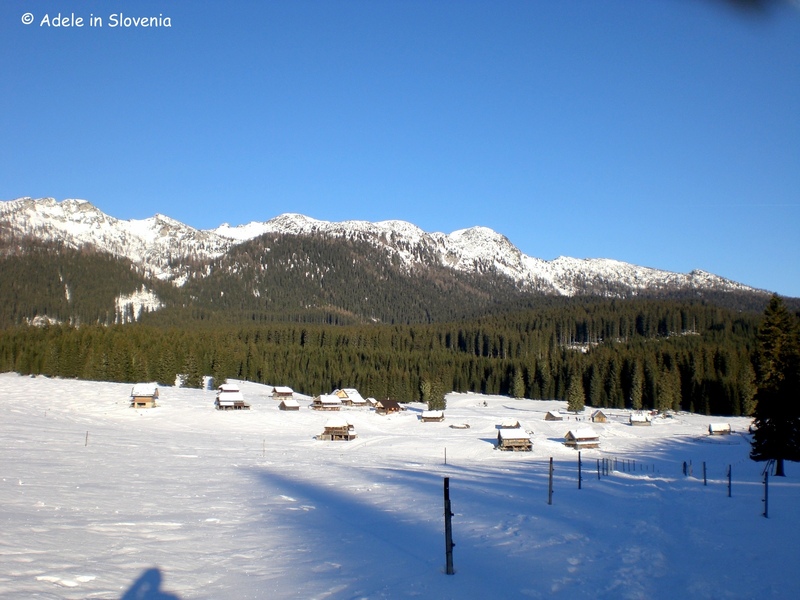 New Year’s Eve in Slovenia – How, Where and Hangover Cures! 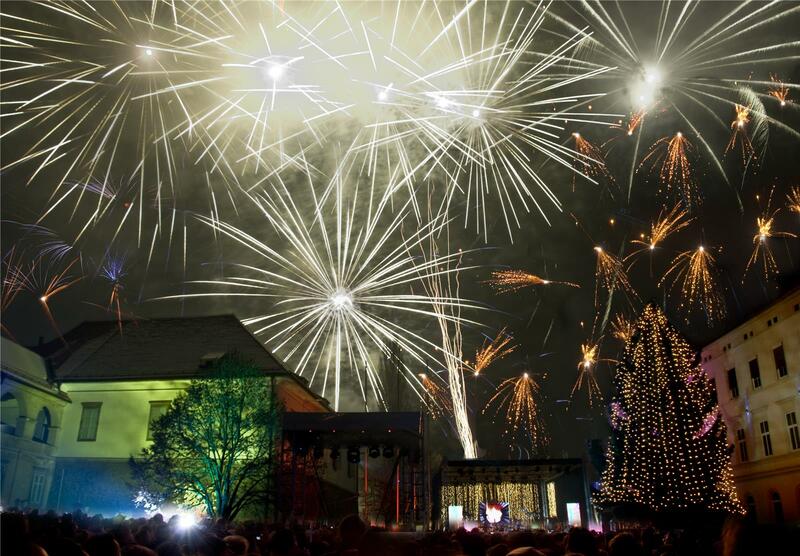 Generally speaking, Slovenes love New Year’s Eve and really go to town when it comes to celebrating! 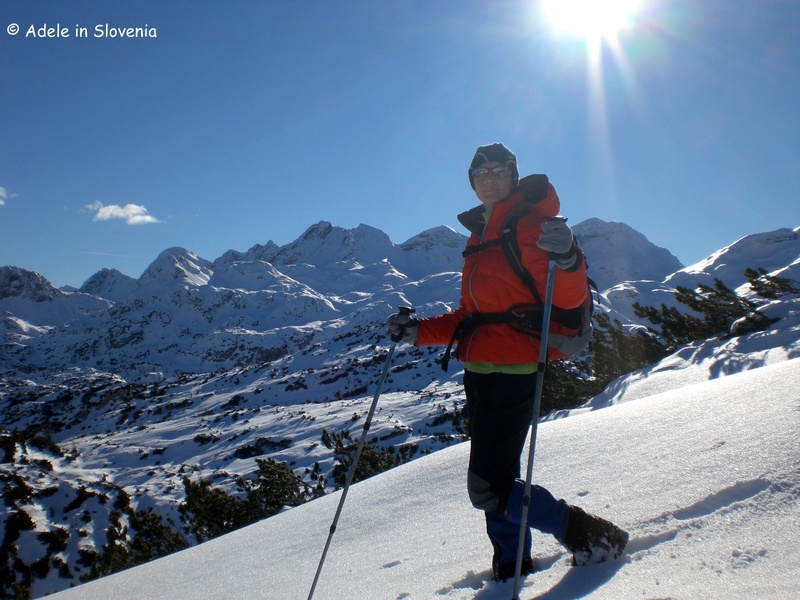 So, if you are going to be, or are thinking about, celebrating New Year’s Eve in Slovenia, here are some ideas of how, and where, to see in the new year in style. You won’t have to go far to find new year’s celebrations, since pretty much every village, town, and city has some kind of celebration. And even if you don’t see them, you will certainly hear them! 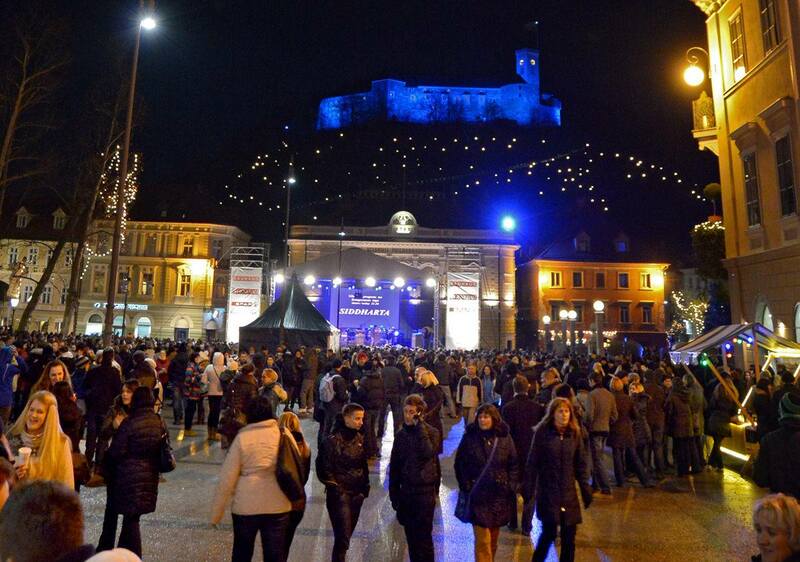 There are New Year’s Eve concerts held in several of the city centre squares from 9pm onwards. 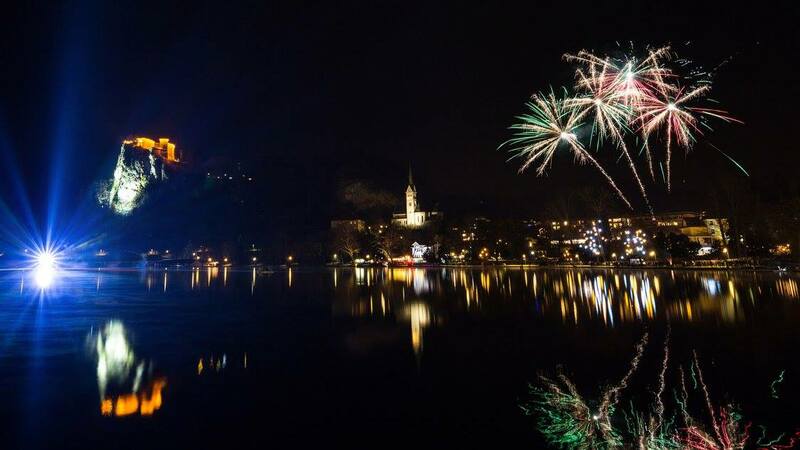 Lake Bled is another popular place to spend New Year’s Eve. I saw in the new year there a few years back; first taking a (brisk!) walk around the lake, then settling down with a friend and a mug of mulled wine to watch the fireworks display above the lake. 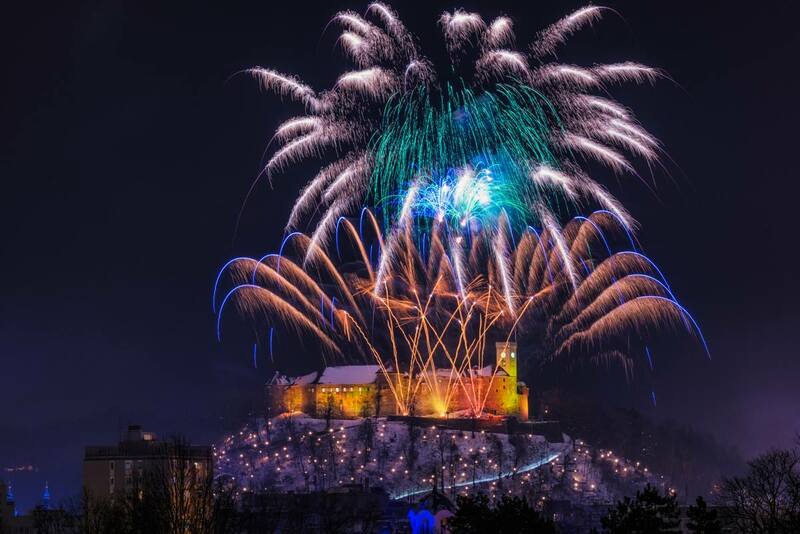 There are New Year’s Eve celebrations in all the major cities, including Maribor, Celje, Novo Mesto, Nova Gorica, Piran, Kranj, Velenje etc., as well as smaller local events. 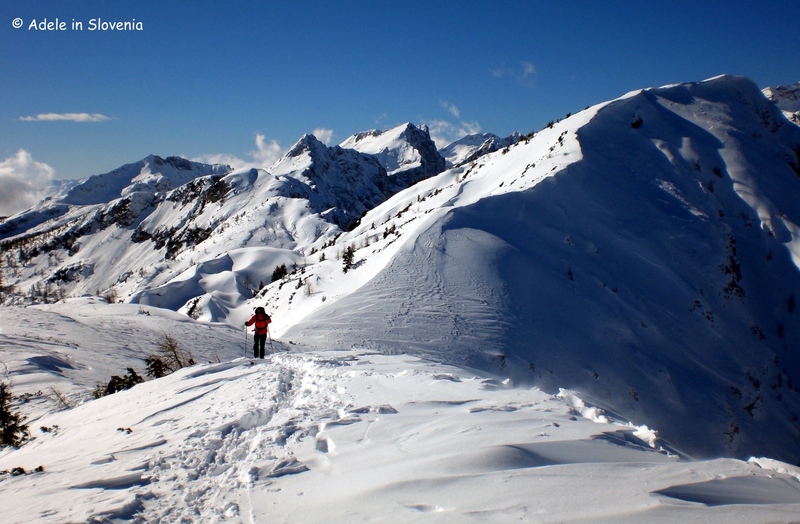 A more unique way to see in the new year is to visit the mountains. 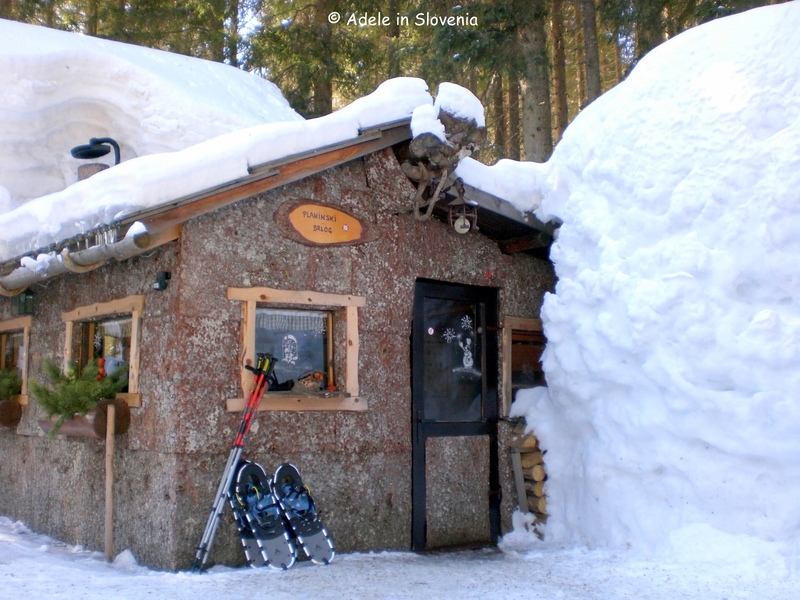 Quite a few of Slovenia’s mountain huts hold house parties on New Year’s Eve. Expect hearty food alongside the wood-burner, plenty of schnapps, and obligatory singing! 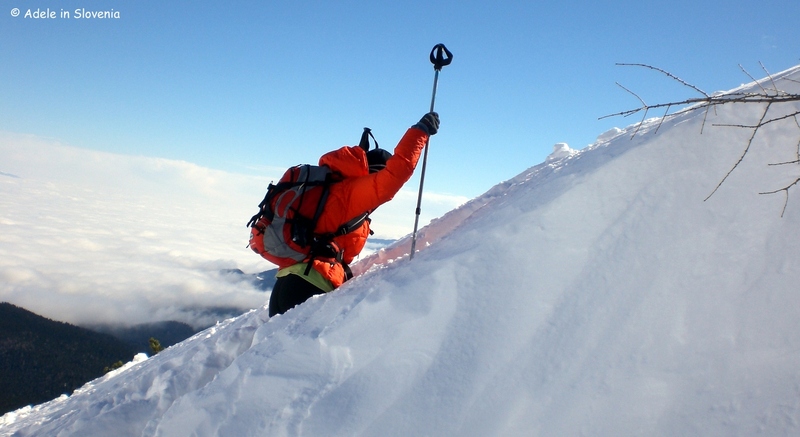 Of course, don’t forget that the next morning – yes, the one after the night before – you will have to hike back down! 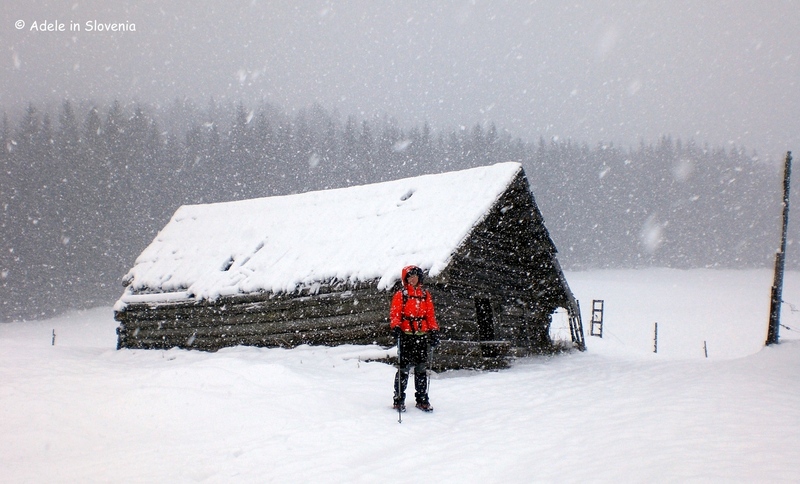 You might find the hut half buried in snow, as I did here on the Pokljuka plateau, but that’s all part of the fun! 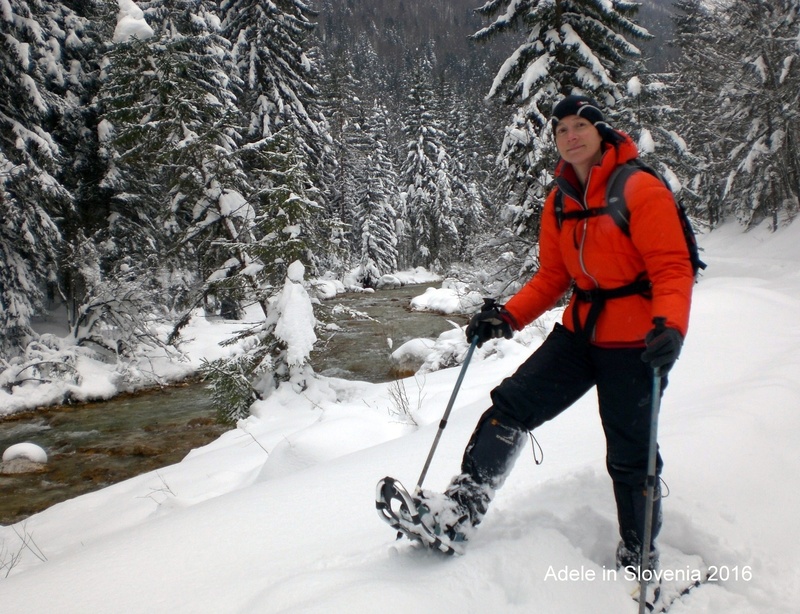 A pair of snowshoes, as seen below, definitely aids access when conditions are like this. If it’s a nice sunny New Year’s Day, what better hangover cure can there be than this! If you prefer a ‘hair of the dog’ style hangover cure, then be sure to try out one of numerous kinds of Slovenian homemade fruit schnapps, but beware, the homemade versions are often strong enough to blow your socks off! I have to admit to being a bit of a killjoy when it comes to New Year’s Eve. I can take it or leave it, preferring Christmas and time spent with family to loud parties and – as we all know – the world is always still the same the next day, despite all the new year’s resolutions! 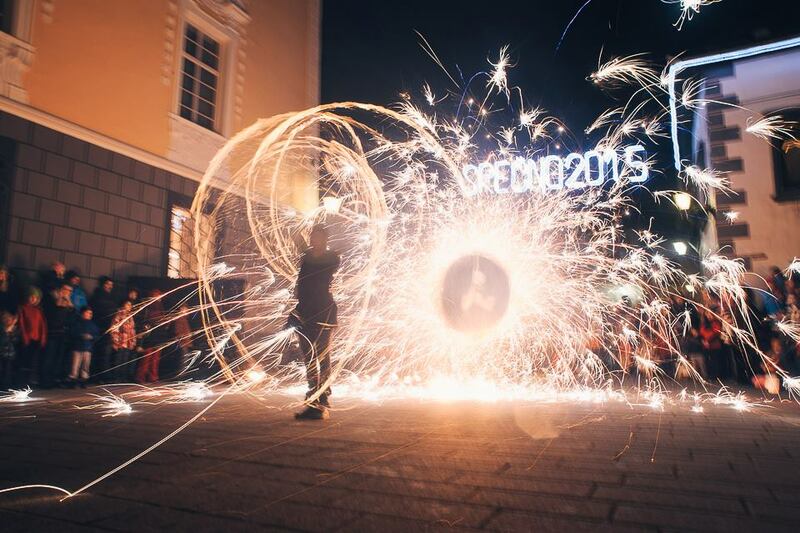 However, since I’ve been in Slovenia, I have tried to embrace New Year’s Eve a little more, and have tried a number of different ways of celebrating. If you’ve been a good girl or boy, then Old Man Winter (Dedek Mraz) may visit on New Year’s Eve! I met him at Vila Podvin on New Year’s Eve 2014/2015, whilst enjoying a gourmet dinner prepared by one of Slovenia’s top chefs, Uroš Štefelin. 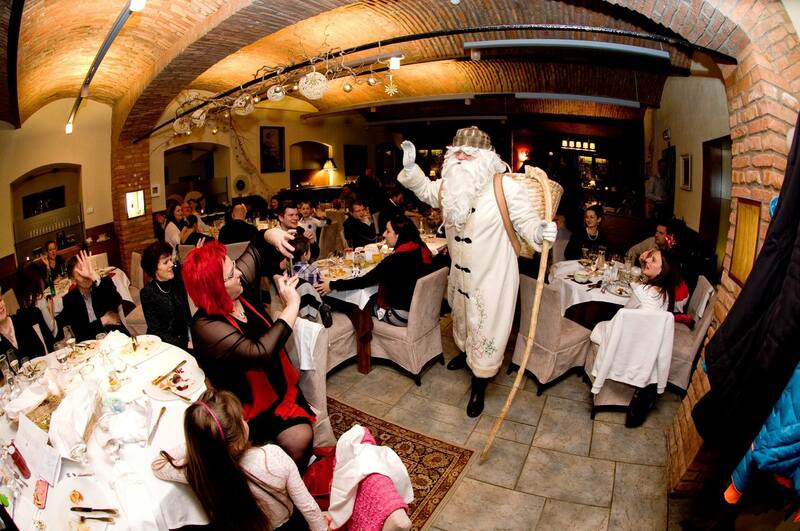 Families with young children especially enjoy the New Year’s Eve celebrations at Vila Podvin. This year the fun begins at 7pm – reservations essential. New Year 2015/2016 was spent at another local restaurant, Kunstelj Inn, whilst other years I have just walked from home into the heart of my hometown of Radovljica where the celebrations are focused around the historic old town centre, with live music and merriment. This year in Linhart Square, the heart of the medieval old town, there will be live music and merriment with the Gašperji Ensemble from 11pm – 2am. There have been a couple of times when temperatures having been well below freezing and I couldn’t face going out in the cold and the appeal of staying home in the warm won over! If you do venture out in the cold at midnight, be sure to wrap up well! Wherever and however you choose to celebrate, I wish you a very HAPPY NEW YEAR and a healthy and prosperous 2017! 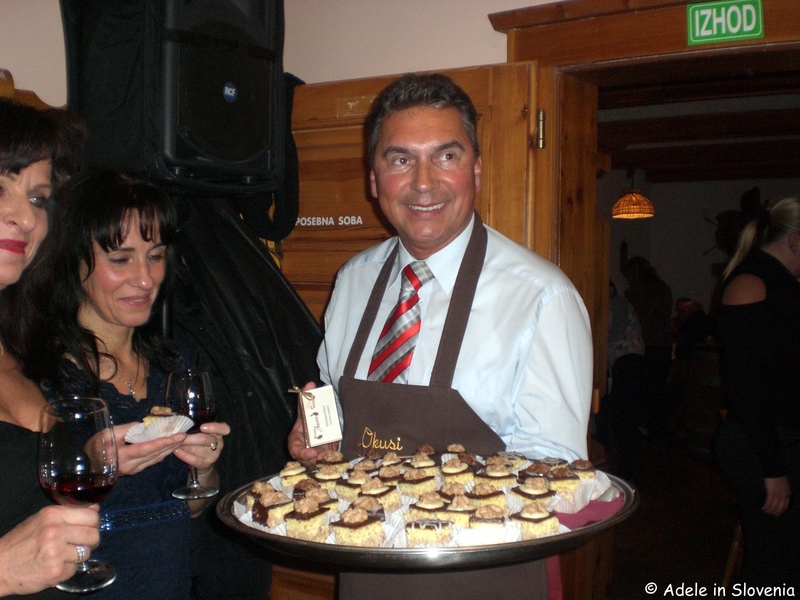 Taste Radol’ca 2016 – The Final Party but Far From the End! In one way I was pleased to see the back of November – 22 days of rain, with the odd bit of snow thrown in for good measure – but the end of November also brought the end of the month-long Taste Radol’ca 2016, which isn’t so much sad as time for a celebration of all the hard work put in by the chefs during the past month and the even harder work put in by the diners – including me – having the tough job of trying out all the menus! If nothing else, my waistline will be pleased it has come to an end, though, with the festive season all but here, there’s still plenty of gluttony to come, no doubt! 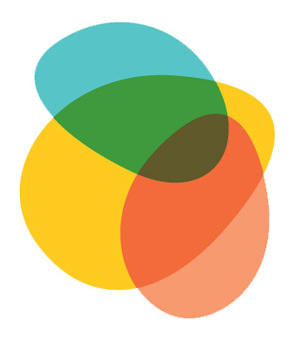 Each year different restaurants host the opening and closing events and this year the Taste Radol’ca Final Party took place at Draga Inn in Begunje na Gorenjskem. 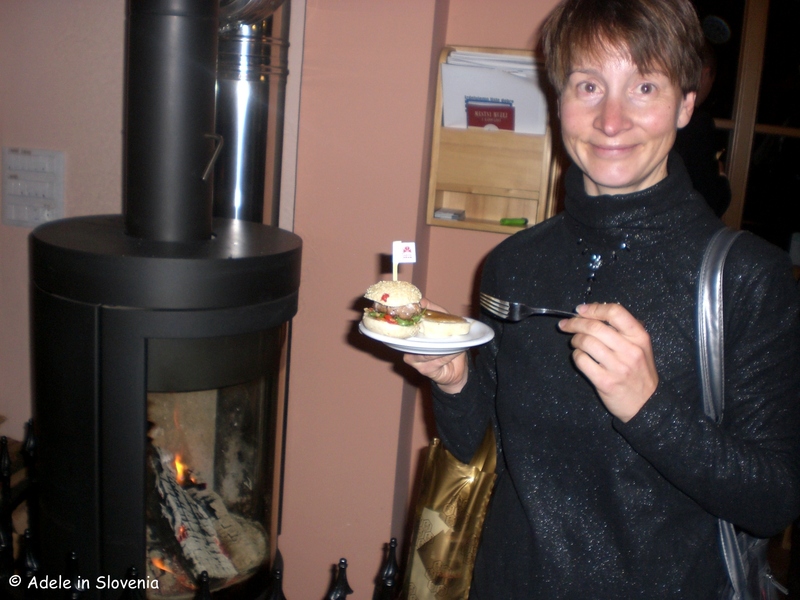 We began outside with hot punch, much needed on a chilly December evening, and food to keep us warm provided by Gostilna Tavčar and the Globočnik Excursion Farm. 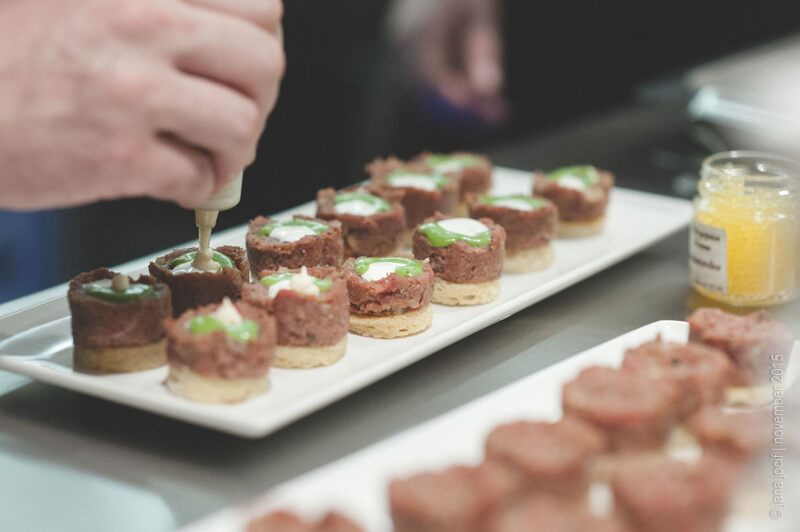 In contrast to the opening event, which is a somewhat more formal sit-down multi-course meal that showcases the talented chefs, the final party is more a relaxed, social, let-your-hair down party and a chance to hobnob with the chefs. Thanks Uroš (Vila Podvin) and Mišo (Joštov Hram) for helping keep me warm! 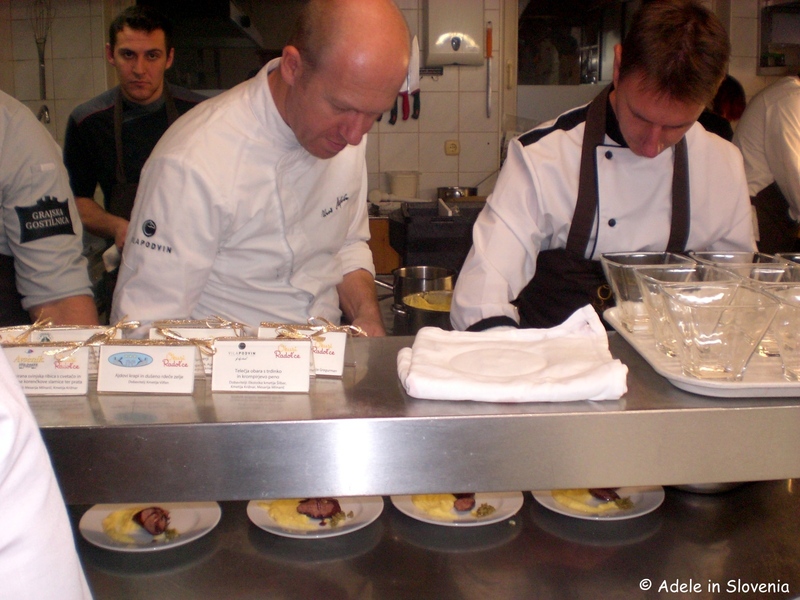 The chefs from the 13 participating restaurants once again did a magnificent job, each preparing a small dish for us to try. Bite-size dishes, each of them delicious, and all made using local ingredients. Too numerous were the dishes to show them all, but here are a few photos to drool over! 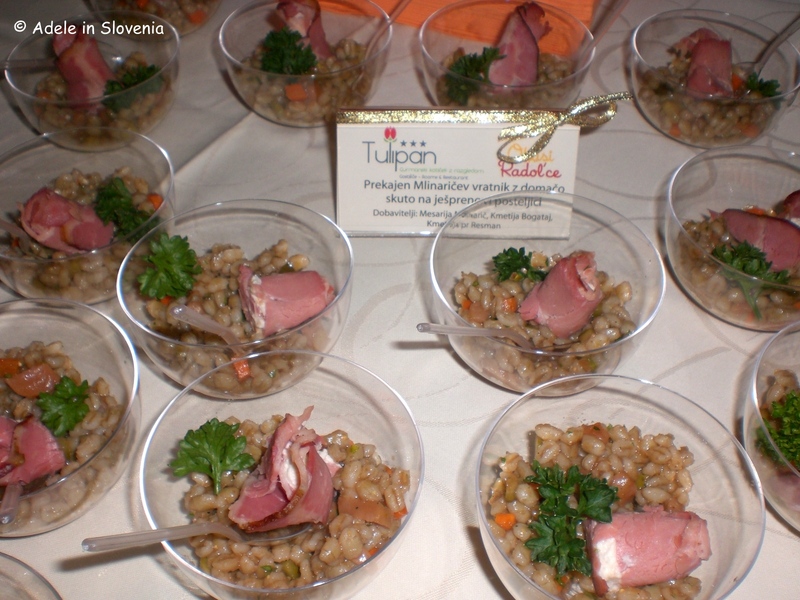 Gostilna Tulipan dished up smoked pork neck with curd cheese on a bed of barley. 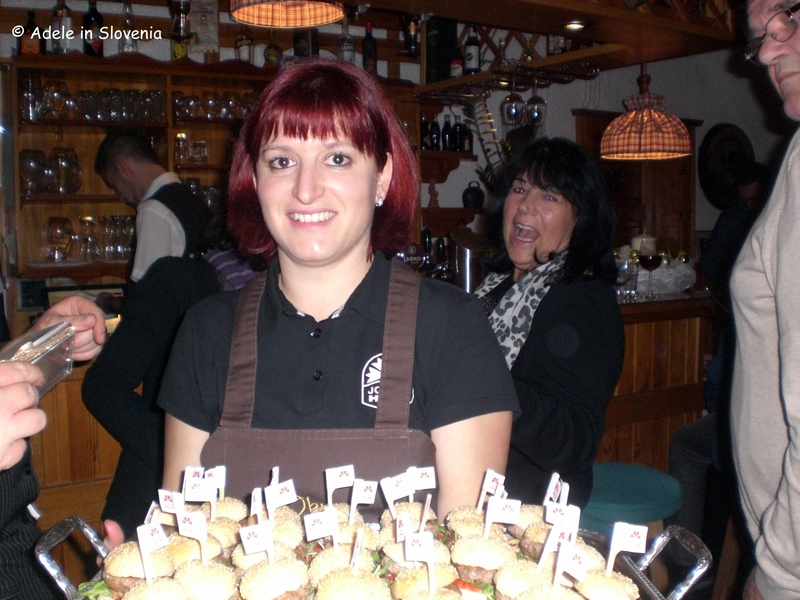 The ever-popular Joštov Hram mini-burgers were a big hit! I found my place next to the log-burner to keep warm and enjoy mine! 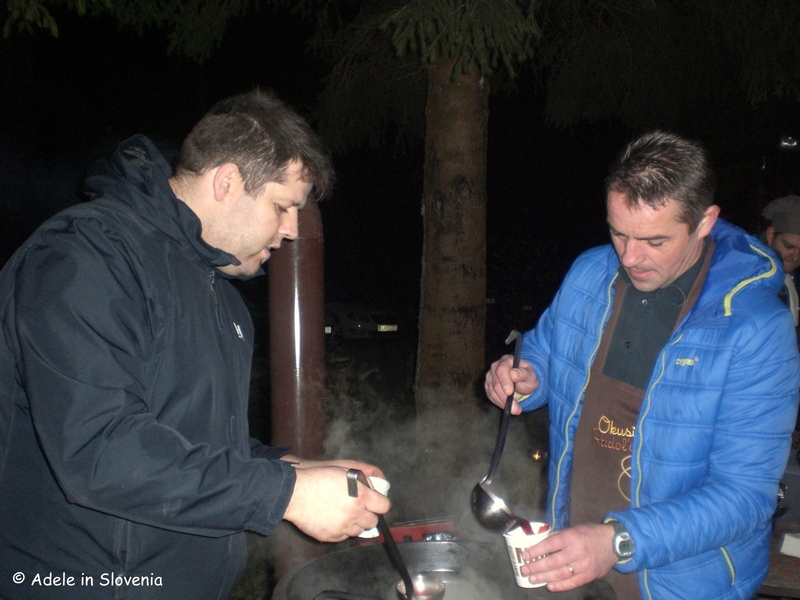 Jože and chef Aleš from Lectar Inn had a great system going providing us with their homemade štruklji. And of course the desserts didn’t disappoint either. Chestnut cake prepared by Gostilna Avguštin. 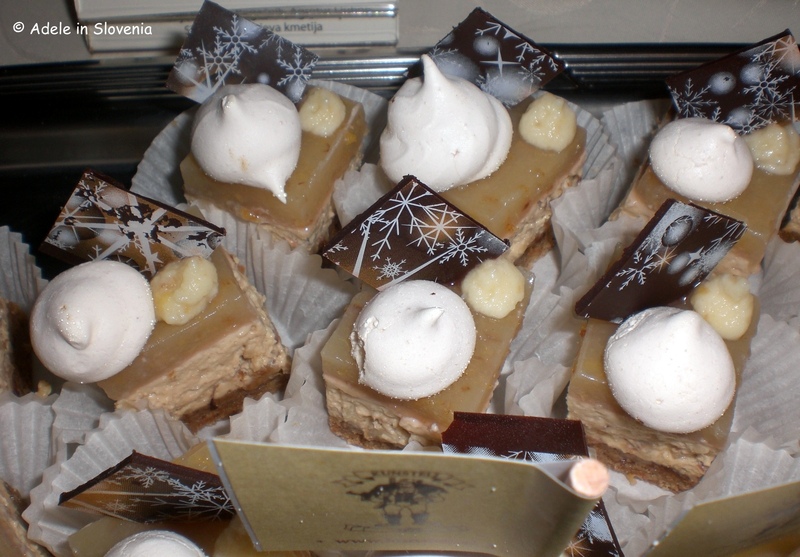 And a delicious creation by Maja at Kunstelj Inn – a winning combination of a gingerbread base with a caramelised walnut, apple and meringue topping. But, it’s far from the end of the Taste Radol’ca story. In addition to their regular menus, all participating restaurants also offer Taste Radol’ca dishes, prepared using local ingredients, throughout the year. You can identify these dishes on menus by the small coloured bee next to the name of the dish. So, what are you waiting for, you can now Taste Radol’ca all year-round!